Active Seating- Is it a Right Move for your Classroom? Why teach students to adopt a sedentary lifestyle when you can use active seating to combat inactivity, obesity, and other associated health issues? By filling your classrooms with active seating options, students will enjoy comfortable and safe chairs and stools that will encourage activity and discourage sedentary behavior, without detracting from educational goals–in fact, active seating enhances a student’s ability to engage in learning. Check out the latest movement in classroom seating. The Zenergy Ball Chair by Safco combines the active benefits of sitting on a Pilates or exercise ball with the stability of a stationary chair. Pump up your students’ energy to learn when you pump up these chairs, which come in bright crimson, grass, pink, and black mesh, or antimicrobial vinyl. The Runtz Ball Chair for younger students is perfect for anywhere children are engaged in learning, creative thinking or group interaction. These durable chairs are designed with an anti-burst exercise ball and support up to 250 pounds. Available in multiple sizes, the lightweight, yet sturdy Hokki Stool by VS America encourages safe rocking for an active learning experience. These stackable stools come in bright primary and secondary colors to liven up any classroom and can be used in group settings or individual learning stations. The Hokki Stool is a comfortable seating solution that allows students to burn calories while simultaneously enhancing concentration. The convex base allows for movement in all directions, which is critical to student development as physical movement both increases well-being and encourages the physical and intellectual maturing process. The polypropylene body is highly stable and durable, but at the same time extremely lightweight. The soft base padding prevents slipping. The foam sitting surface ensures increased safety and comfort while seated. The Zuma Rocker chair by Virco makes a comfortable and active addition to any classroom. The rocker comes in different sizes, for use by students of all ages and the classroom teacher or aide. The chair encourages both active sitting and good posture. This chair comes in a myriad of colors to suit any classroom design, and allows sitters to rock with ease. With the popularity of the Zuma Rocker, Virco has now extended this rocker design into their new Analogy seating line. The seat of the Analogy rocking chair has contoured wrap-around flexible ribs, which are dynamically tuned to allow the upper back to flex more easily than the lower sections, a key to combining comfort and support. The Noodle Chair by Smith System rounds out active seating category with a revolutionary patented suspension, allowing the seat pan to tilt slightly in all directions. This not only makes the chair more comfortable than traditional classroom chairs, it encourages the student to engage his or her core muscles while seated. These chairs have been embraced by the ADHD community looking to provide seating that can keep up with the energy of children diagnosed with ADHD. 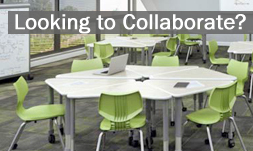 All of these active seating solutions are ideal for classroom use. They’re easy to clean, lightweight, comfortable, and are available in colors that will excite learners. Many schools are opting for a pilot test by only outfitting one classroom with these chairs to observe how students will react with some encouraged movement. Most schools find the results very favorable and often work to include active seating options in all classrooms. For more information on how active seating can improve your students’ educational experience, contact us today. I’d like to see prices on these chairs, please. I’d like to get info and pricing for a first grade classroom. I am attempting to incorporate active seating into my classroom but am having trouble attaining the funds to purchase supplies. Do you know if there are any programs or businesses that could hel me with this dilemma? Gerry, I was able to get some balance balls and discs for my classroom through donorschoose.org. I use stability balls in my K classroom and love it. The kids have “ball buddies” and switch from chair to ball throughout the day. I have different sizes and different styles depending on what the students prefer. At the end of the day or leaving the classroom the students put their balls on that tables using plastic salad plates I got from Target.